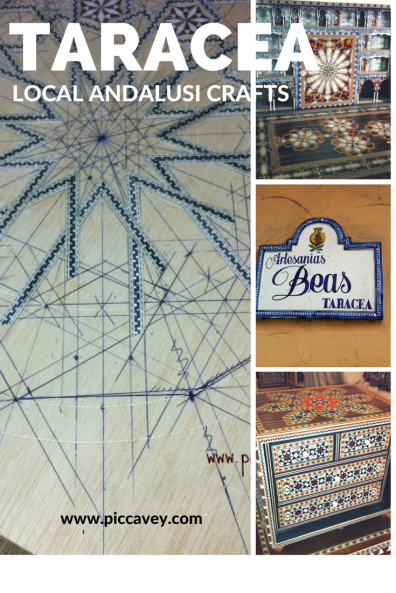 Back in 2012 I discovered the craft of Marquetry, known in Spanish as Taracea here in Granada. The word taracea comes from the arab word ´Tarci´ which means to incrust. Since the 14th century Taracea has been produced in the city of Granada. So that´s over 600 years old. It´s the only place in Spain where it is still made and sadly seems to be a dying art form. As I write this I´d love to think that sharing this information makes a difference. Hopefully people visiting Granada can appreciate this local craft and understand the intricate work that goes into each piece. The origin of this craft came from the north of Africa and arrived to Spain with Moorish rule. 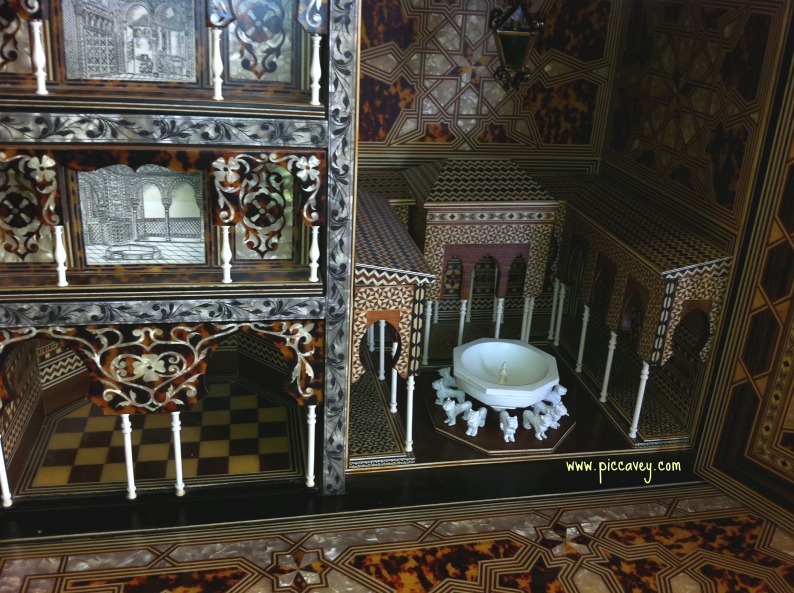 In the historic region of Al-Andalus these crafts adoran palaces and the Alhambra too. However long after the conquest of Granada, the Catholic kings Isabella and Ferdinand Granada continued to use the craft in religious ornaments, furniture and other everyday objects too. Royalty often used precious stones in decorations, nestled among geometrical shapes in exotic wood. 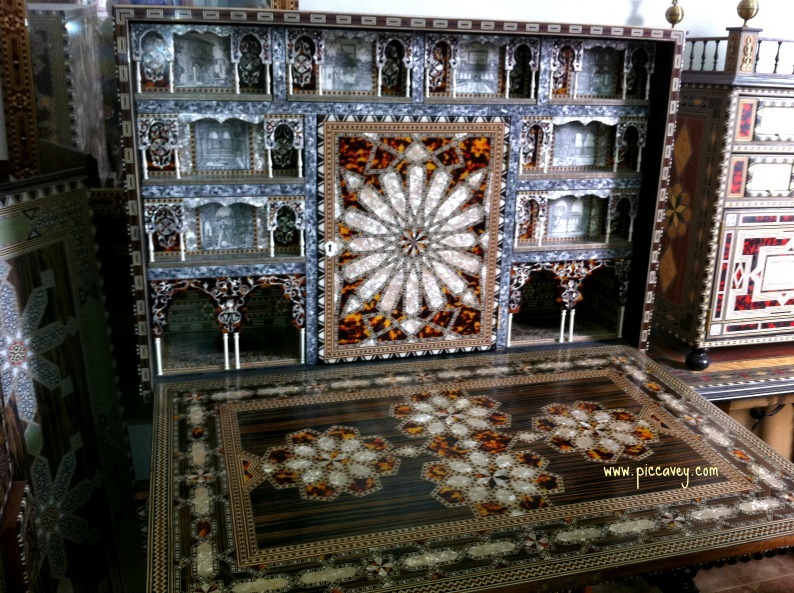 Other materials include mother of pearl, tortoiseshell, ivory or bone as inlays. Always mixed with different kinds of wood to get the maximum variety of detail anad colour. Over the years I have been in Granada I have seen two different workshops in the city in detail to understand how these unique pieces are made. My first impression is it seems a fiddly business. To begin with they make lots of stars, which consist in joining together many long rods of different woods or materials. 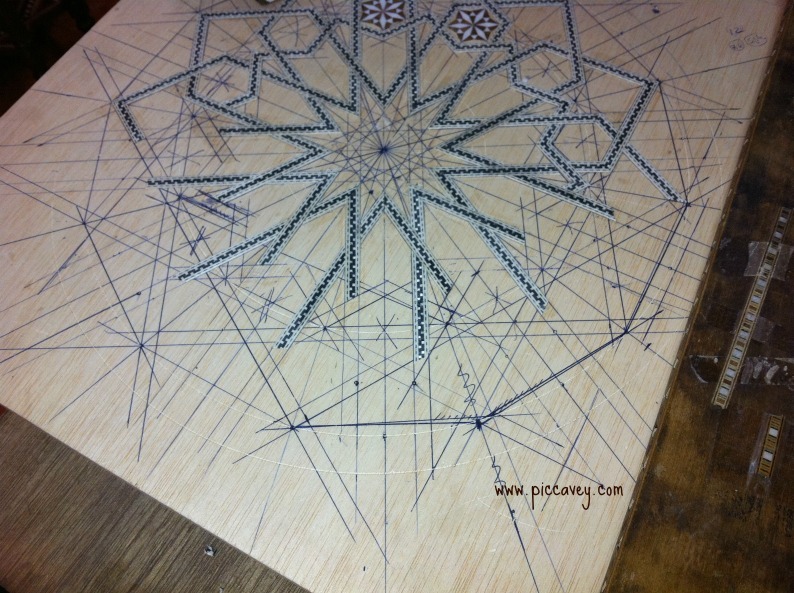 When the rods are set together well, then they cut slices of this rod which make a piece with a star shape on which decorates the piece of furniture. If you want to take a close look at this yourself on the Cuesta Gomerez just off Plaza Nueva the Artesania Gonzalez shop have some on show. In the making of these items many different materials are used mother of pearl, tortoiseshell, bone, exotic woods and others, giving different finishes and colours to the work. They also make an edging which looks like tape, divding the star patterns from each other. These strips are made from very thin strips of wood, which is made in a similar way to the star rods, but cut across horizontally along the length instead of vertically on the tip. Once they have ready the edging and the stars they can begin to work. They choose the box or piece of furniture to work on and draw the design. Then adding all the pieces on, finally it is pressed a vice to tighten up the pieces and set them into place. Finally it is filed to make sure that the top surface is perfectly level and then to finish it´s varnished to seal. Some of the amazing pieces were saw in the workshop took a year and a half to complete. The gentleman who kindly showed me around his workshop at Artesania Beas is around eighty years old and still works on this art. Drawing the scenes of the Alhambra palace using the bulls bone to decorate the most detailed parts. He explained to me how difficult it is to engrave bone, and tells me that his hands have suffered over the years from the work. 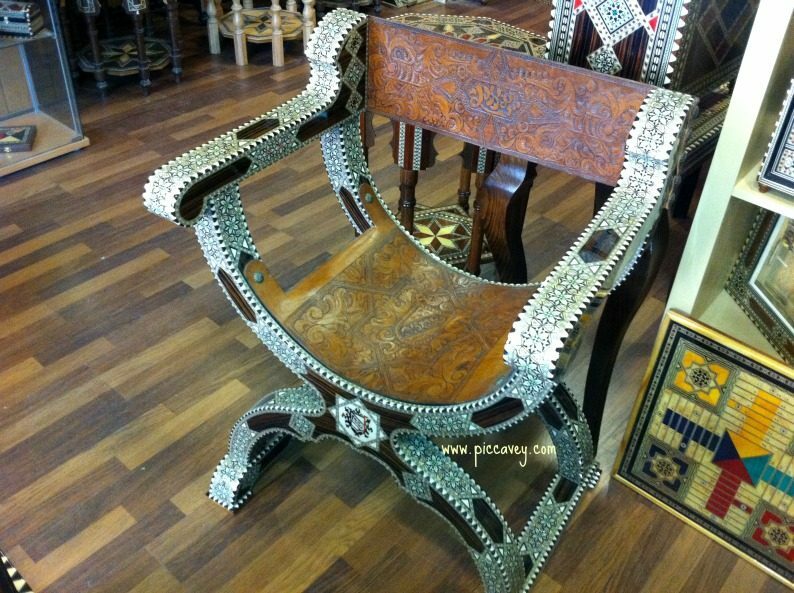 One of the pieces that particularly got my attention was the Jamuga chair, you can just imagine Aben Humeya or an Princess Moryama sitting on the chair beckoning their servants or contemplating one of the fountains in the Nasrid palace. mother of pearl on the top. Certainly an unique gift and good for storing small items in. 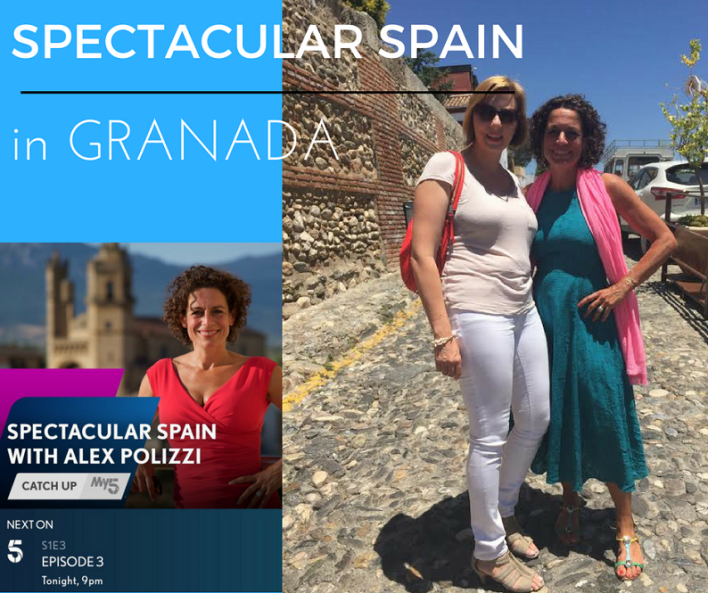 Just watched it on catch up-amazing, and what a great programme showcasing Spain too. I have two boxes at.home. I did not realise how they were made so find the TV programme fascinating. But, how can I tell they are the genuine marquetry and not some sort of copy? They are from.my mum-in- law who visited Grenada many years ago but is no longer alive to ask. The copies are printed on and tend to be much duller, flat, not light in the pattern. Also the genuine makers add a stamp or sticker on the bottom with their workshop name. It’s gorgeous isn’t it? My eldest son made me a taracea tray while at carpentry college here in Jaen several years ago. Can you buy bookmarks there? My son brought me back one from his travels and it cracked. Yes they do all manner of things, bookmarks, coasters, trays, tables, chairs, chessboards. Its quite amazing to see up close how they make it.